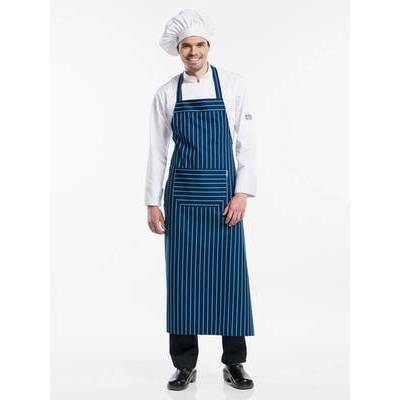 Just like our �Standard� bib apron, the Chaud Devant BBQ Apron Blue Stripe is a simple, understated design. The difference lies in the format: the BBQ is longer and wider. This means that the chef can totally focus on the grill and the hot coals. The Chaud Devant BIB Apron is practical, no-nonsense bib apron for the hottest spot in the kitchen. The fabric is positioned perpendicular at the top of the bib and on the pocket, creating a stunning stripy contrast.